Here are a few interesting photos from the annals of radio communications' 1935-era history that include airborne, land mobile, and fixed operator stations from around the world. Japanese amateur radio operator Seichiro Handa is shown sitting in his 'shack' donning headphones and a Morse code key. 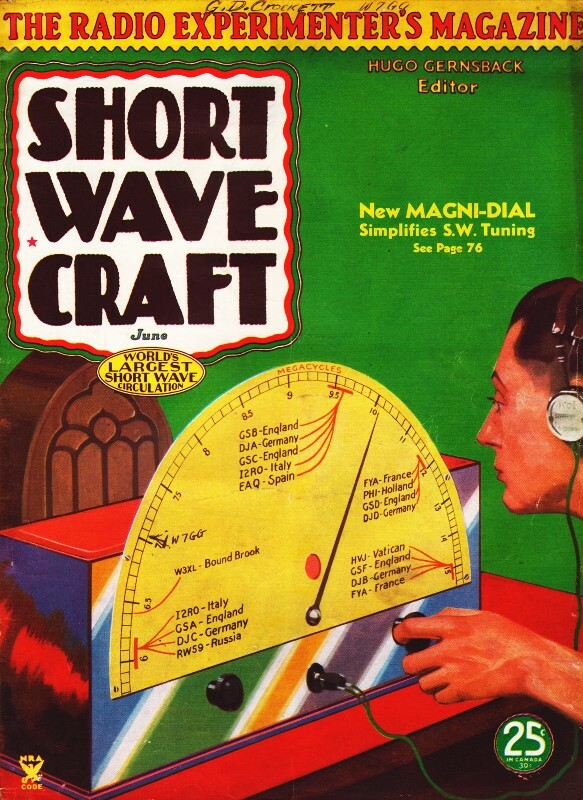 The author mentions that judging by his high quality radio equipment, Mr. Handa's finances seemed to be unaffected by the Great Depression that hit the United States and other Western countries beginning with the stock market crash in October of 1929. 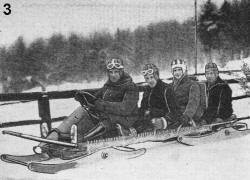 Short Waves recently carried a running description of the sensations experienced in the mile and one-half run of this bobsled at Lake Placid, N.Y. At times the bobsled reached a speed of 70 miles an hour. 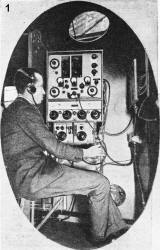 The young man shown in the "close-up" is Eugene S. Darlington (2), youthful General Electric Company, engineer; and he is carrying; a portable 7-meter radio transmitter on his back, which is complete with batteries and all the "trimmings"; the microphone is shown suspended on his chest. 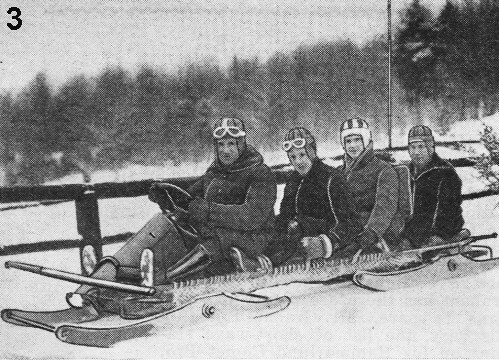 The short-wave voice signals from the transmitter aboard the speeding bobsled (3) were picked up and transferred to another transmitter in the vicinity, which relayed them on to Lake Placid Village, where the voice was picked up by an all-wave receiver and fed into a telephone line to Schenectady, where it was re-broadcast by station WGY and its short-wave "pal," W2XAD. The top left photo (1) shows a new plane built for the Viceroy of India, which is fitted with the latest Marconi short-wave receiver and transmitter. Shades of Heinrich Hertz! Yep - a Ham station of 1916 vintage! 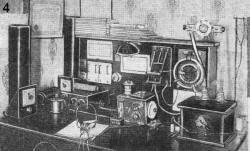 (4) Transmitter, receiver, an' everything. On the wall is a membership certificate of the "Radio League of America," established by Hugo Gernsback, editor of this magazine. This station operated on 200 meters, real short for that period, and the receiver was a "1-tuber," observable in the center of the photo. Note the rotary spark gap at the right and the oscillation transformer made of copper ribbon, just below the gap! Roswell J. Parker. 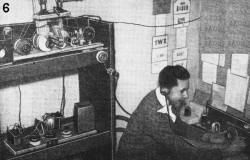 A Japanese Ham (5) operating an amateur transmitter and receiving station in Japan under the license call J1DM. The picture shows 18-year-old Seichiro Handa, a student; apparently he has not heard of the depression (a very common subject of conversation in the occident) judging by the size of the meters on his control board above the table. More power to him! 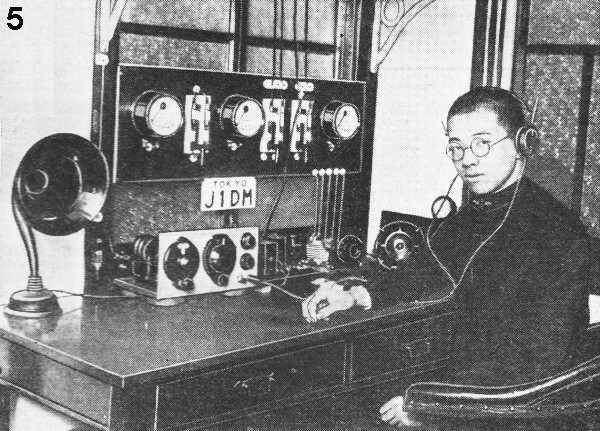 Fourteen-year-old radio amateur, George Alan Bryan of Derby, England (6), who is reputed to be one of the youngest European Ham station operators. His call letter is G2AFV.